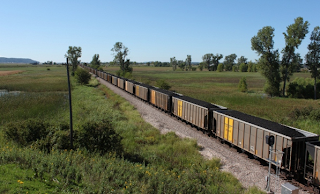 LINCOLN, NE (NET Radio) Editor’s Note: This Signature Story was reported by QUEST Northern California and is the second in a four-part series, “Coal at the Crossroads” exploring coal in the U.S. This series is produced in collaboration with QUEST Northern California (KQED San Francisco) and its partner public broadcasting stations. For more QUEST Nebraska stories visit netnebraska.org/quest. Bluestem Lake near Lincoln, Nebraska is five miles north of a coal-fired power plant. It is also one of 85 bodies of water in the state under a consumption advisory because of fish found to have elevated levels of mercury in their tissues. Half of the airborne mercury pollution in the U.S. comes from coal-fired power plants. After years of study and debate, the Environmental Protection Agency (EPA) is planning to announce new limits on mercury from coal plants in November. Ken Winston of the Nebraska Sierra Club believes the agency is doing the right thing. "When you burn coal, mercury goes up into the atmosphere," Winston said. "It comes down in the form of rain. Fish eat it. People eat the fish. It can be very damaging and have a long term negative impact on the development of children. So it's something we need to get out of the environment as much as possible." Bluestem Lake, near Lincoln, is under a consumption advisory for channel catfish with eleveated levels of mercury. Sheldon Station Power Plant produced 140 pounds of mercury per year. A Burlington Northern Santa Fe train carries coal from Wyoming's Powder River Basin. The EPA says its proposed new mercury rules could reduce emissions across the country by 91%. Meanwhile, utilities are scrambling to meet other new federal regulations and industry groups are asking the government to slow down. The Nebraska Public Power District operates two coal plants. Sheldon Station is south of Lincoln near Bluestem Lake. Gerald Gentleman Station, the state's largest coal plant, is in western Nebraska near Sutherland. Based on the proposed rule, NPPD Environmental Manager, Joe Citta, predicts the utility will need to install equipment that uses activated carbon in order to remove even more mercury than control systems already in place. Installation costs would add up to $20 million. On top of that, NPPD would have to budget for another $10 million in operating and maintenance costs. "The system is several million dollars," Citta said. "But what really makes it expensive is the operating cost because activated carbon is rather pricey." NPPD will spend 35 million dollars to meet another new regulation reducing smog-forming pollutants that cross state lines. That rule, called the Cross-State Air Pollution Rule (CSAPR), was announced in July and takes effect in January. Citta says it requires more cuts than many in the industry expected for pollutants like nitrogen oxides (NOx) and sulfur dioxide (SO2). "This caught our state, many other states also," Citta said. When the final rule came out they had reduced those by an additional 40%. We felt the proposed rule was manageable. We would have had to do some things. But they were certainly more achievable than this additional 40% reduction." Nebraska utilities feeling rushed by regulation are hoping to get some extra time. Nebraska Attorney General, Jon Bruning, is filing a lawsuit against the interstate smog rule , calling it another example of an "overreaching federal government run amok." A bill passed by the House of Representatives could slow things down by commissioning a study on the economic impact of the EPA's emissions agenda. Steve Gates of the American Coalition for Clean Coal Energy calls it a reaction to a lot of regulation in a short period of time. "In a state like Nebraska where 65% of our electricity comes from coal, something is going to happen and the guess is electricity prices go up immediately," Gates said. "You know, there's just a lot of economic implications that really should be looked at before we jump into something that no one knows the outcome economically." Nebraska rails are a major thoroughfare from Wyoming to power plants in the Midwest and southern Plains. Gates says the state's economic ties to coal show the advantage of having easy access to inexpensive energy. "We're fortunate enough to be in the top ten lowest states for electricity in the country," Gates said. "What we need to do is find a balance between reducing emissions the best we can while also keeping an eye on what we're going to do to local economies if we enact something too quickly." The EPA claims that the mercury rule will have a positive economic impact in the end by providing health savings of up to $140 billion from reduced asthma, heart disease and other serious ailments. Gates says the EPA underestimates the cumulative impact of multiple rules all coming down at once, particularly in a bad economy. The Sierra Club's Ken Winston believes power companies are capable of covering costs that they have not paid in the past. "They can absorb the cost of making these changes much more easily than a person can," Winston said. "An individual whose child doesn't develop appropriately because they've had mercury poisoning, that's a life that's destroyed and we can't tolerate that." QUEST Nebraska is a pilot multimedia series about the people behind Nebraska science and environmental issues and how their work is changing the way we live. QUEST Nebraska utilizes all of NET's media platforms, educational resources and partnerships to bring its audience the best science media in the state. Copyright (c) 2011 Nebraska Educational Telecommunications. Powered by Blogger.